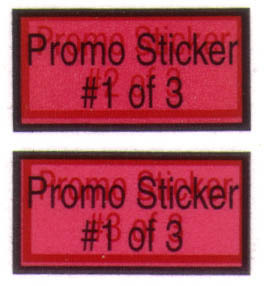 On the back of the red promo stickers, in the bottom right corner, is a number that says either #1 of 3, #2 of 3, or #3 of 3. Mr. Coffin is #1 of 3. But behind the black number is a fainter red number. On some Mr. Coffins this number is 2, on others it is 3. See the picture below. I'm not sure who discovered this, but it was a GPK collector and not a WP collector. These were given away in GPK II boxes in Spring of 2004, which is why the GPK collectors were looking so closely at them.